This skin-reparative professional level luxuriously rich night cream deeply hydrates and nourishes the skin with high concentrations of Ascorbyl Glucoside, an incredibly stable form of water-soluble Vitamin C that exhibits high antioxidant activity, aids in the synthesis of collagen while inhibiting the formation of melanin and effectively protect and repairs the skin from free radical damage. Vaccinium Myrtillus (Bilberry) Extract contains anthocyanosides and Vitamin C that help skin fight hyperpigmentation while it’s strong antioxidant properties help prevent and reverse damaged cells. Other powerful ingredients include Sodium Hyaluronate (Hyaluronic Acid), a special combination of high- and low-weight hyaluronic acids that expand once in the skin to provide excellent hydration. Camellia Saneness (Green Tea) Leaf Extract, a potent antioxidant with powerful anti-inflammatory and helps prevent collagen breakdown. Tocopherol Acetate (Vitamin E) is a powerful lipid-soluble antioxidant superstar, Saccharide Isomerate, a water-binding agent and emollient and Panthenol (Vitamin B5), an excellent humectant that adds intensive hydration to the skin. Younger looking skin is right one click away from you! A plant antioxidant with skin soothing and moisture binding properties. Contains anthocyanosides and Vitamin C that help skin fight hyperpigmentation while it’s strong antioxidant properties help prevent and reverse damaged cells caused by free radical damage. 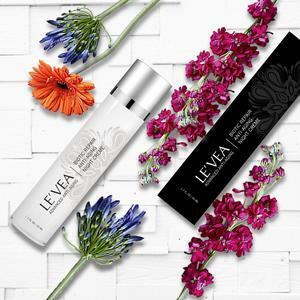 Powerful water-binding agent and emollient that binds to the free amino groups of lysine in the keratin of the stratum corneum providing long-lasting miniaturization. An excellent humectant that adds intensive hydration to the skin. Known to enhance the formation of new skin cells while providing healing and anti-inflammatory benefits.